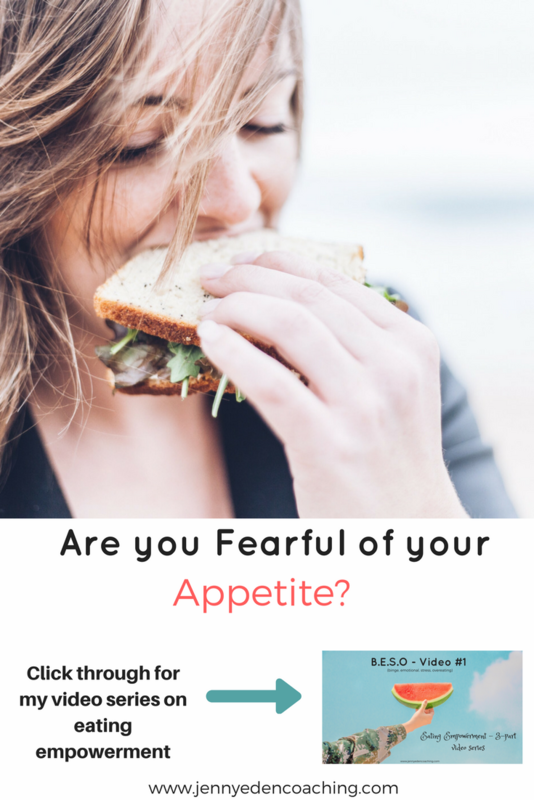 Are you Fearful of your Appetite? My grandmother used to adore watching all her grandkids eat. She looked on after preparing a loving meal with such pleasure as we ravenously ate all of her Lithuanian delicacies – sweet and sour meatballs, mondlebread, cinnamon rolls, chicken soup. You see, having a hearty appetite back then was not only encouraged but expected! Somewhere down the road however, this adoration for my appetite became tainted with judgement as I grew older. No longer was anyone looking on with happiness as I freely ate as much as I wanted. Later on, it became tinged with side glances and looks of worry or even disgust. Was it because I was larger than the other kids? Was it because my Grandma glory days were just a mirage and in reality everyone judges their own and everyone else’s appetite? Whatever it was, I learned I had to hide my hunger. Moreover, I learned to ignore my hunger as well. The innate cues I got from my body as to when to eat and when to stop got shoved down and out of consciousness. In its stead was an appetite born from societal expectations, peers and a clock. I would eat when I wasn’t hungry if I knew everyone else was. And I’d shun my hunger if it wasn’t at an appropriate meal time which, of course was on certain intervals. I’d find myself wanting a big meal at 4pm but forced myself to wait until 6pm. Each time, I felt like this annoying, nagging, hunger was just a nuisance that I had to deal with and tolerate rather than embrace and enjoy. When did it become ok to just ignore our body cues? We can certainly hold our breath but sooner or later our body swoops in to protect us by either passing out so we can breath again or resigning to our body’s higher wisdom. Why is it not the same with our hunger? Because, unlike breathing which no one judges and has nothing to do with our outward appearance, hunger is another story entirely. When we show our hunger and honor it, it may mean that we overeat. It may mean that we gain weight. It may mean that we make food choices that we’re or someone else is not happy with. And all of that scares the heck out of us. Because society tells us that a larger body is an unlovable body, and that a robust hunger accompanied with pleasurable eating equals indulgence and hedonism. These messages gets seeped deep into our psyche and informs our food behaviors. Its why we sneak food when no one is looking. It’s why we eat when we’re not hungry (because we have a fear that food will be taken away or unavailable). It’s why we eat by the actual clock and not our internal ones. It’s why we wait until we’re starving to eat and then it’s too late to make rational choices. When we can become “woke” to the unconscious machinations of a society that keeps us from eating intuitively we can only then turn the ship around and truly listen to each of our own internal messages and trust them again, like you did as a baby or toddler. How do you feel about your appetite? Let’s dig into our hunger and understand what it’s telling us so that we can truly honor our bodies in a new and beautiful way. Let’s get curious about it rather than fear it. Let’s map out our own hunger blueprints to see patterns emerge as to when it appears so we can prepare and honor it. 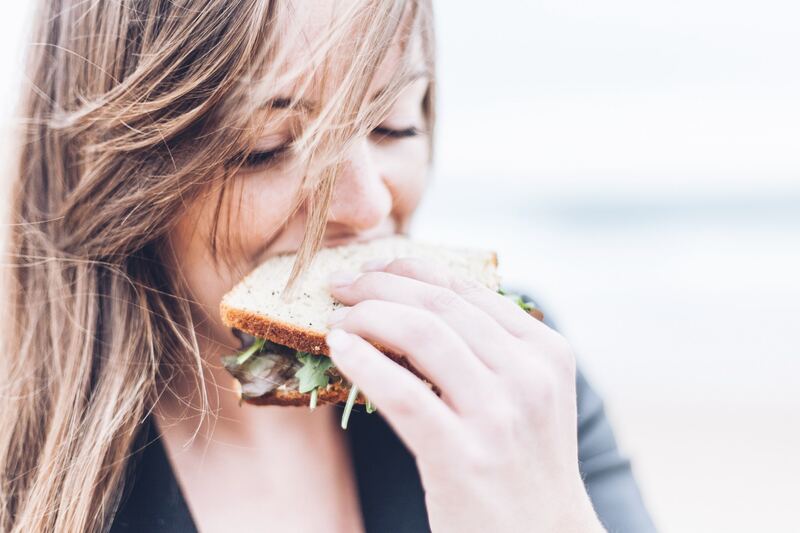 Only when we can let go of judgement about this basic human survival bodily cue and truly listen – can we truly find a way of eating that empowers us all. It lets you know that after a gym workout, you’re starving so best to bring that smoothie next time. It gives you permission to eat dinner at 4pm, if you want. It allows you to plan macronutrient balanced snacks during times when you’re on the go, feel hungry and tend to either ignore it or head for the drive-thru. It allows you to know which foods fill you up for long periods of time and which don’t. If we’re not embracing and honoring our hunger in the first place and pretending it doesn’t exist, none of these things can happen. We’re beholden to external measures to determine when to eat and when to stop. Reclaim your power by embracing your hunger and learning from it. While my Grandma is no longer with us, I know she would be thrilled to see how I again eat with gusto and pleasure. I hope she is looking down on me smiling as she sees my reemergence of love with food again. I know she would be happy.